Do you happen to know which magazine? Sounds like something I would be interested in reading. Universal Model Airplane News, September 1934. The article is by the director of the Daniel Guggenheim School or Aeronautics, Alexander Klemin. Its the issue with artwork of the Macchi Castoldi Mc72 on the cover, copies turn up reasonably frequently on eBay. The wind tunnel model maybe one of several constructed by NAF for the US entry in the 1929 Schneider Cup Race. In 1927 Charles Kirkham (ex Curtiss) and US Navy Lieutenant Alford Williams produced a beautiful seaplane known as the "Kirkham-Williams X". 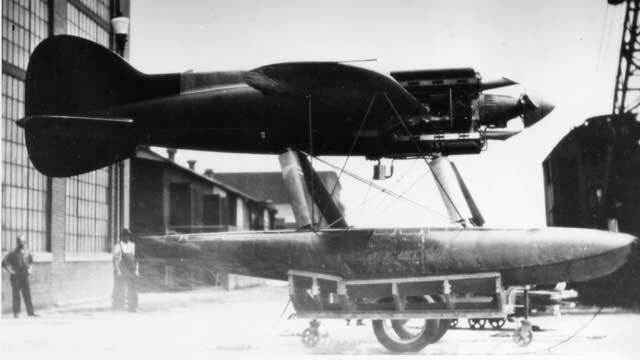 A biplane, it had a pair of Packards mounted on a common crankcase. It failed to reach the race startline following a lack of funds. It's floats were replaced with wheels and in this form unofficially broke a speed record. In 1929 the Naval Aircraft Factory used the "X" as the basis for that years entry into the Schneider Race. It emerged as the "Kirkham-Williams Mercury 1" with a mid-wing configuration and a more powerful Packard. It too failed to reach the startline because the USN would not transport it to Europe. The fuselage, the floats and the "sit" of the model are similar to the "Mercury". The "Mercury" did emerge with straight leading edges to its wings and a ventral fin like its predecessor. Maybe the model exhibits an attempt to modify these areas? The rudder appears to curve at the top in the same way as the actual seaplanes. With an attempted elimination of the ventral fin following removal of the lower wing, the rudder on the model appears to have been designed to meet the fuselage in a graceful (almost Boeing-like) curve instead of using a Curtiss vertical straight-edge. William's problems in 1927 were more to do with serious aerodynamic instability problems with floats than with funds. They tried modifying the incidence and also an alternative set but without success. The 1929 Mercury (not Kirkham, this one was entirely NAF and Kirkham Products were not involved) was overweight and the interim Packhard failed to deliver significant additional power. The aircraft had difficulty getting onto the step and made just one, short flight just a few feet up and probably still in ground effect. The Navy stipulated that Williams must demonstrate that the Mercury could exceed the existing air speed record of 318 mph before they would provide transport, so his entry for the Trophy was withdrawn at the last moment. The windtunnel model looks too refined to me to be anything other than a racer but personally I see no family resemblance to the NAF design. I believe that Grover Loening's name was linked to a possible entrant for the 1931 contest, again to be piloted by Williams, but I can't see his style in this one either. Perhaps it was just a student project at the Daniel Guggenheim School or Aeronautics, or something proposed by the author of the article and director of the school, Alexander Klemin. He seems to have been very highly regarded at the time. Thankyou for putting me straight on the correct designation of the "Williams Mercury". I did know Kirkham was not involved in this project, but unfortunately, his name was added to the designation by a website writer whose material I had just read and for some reason it stuck in the grey cells! The 1929 "Mercury" was actually designed by John Kean who was NAF's Chief Engineer. Did you know it also had another name? Flight of the 8th of August 1929 calls it the "Mercury Hispeed". You may be right about the wind tunnel model originating from the school, also I can't see any resemblance to Leoning's designs either. Personally, I did see a likeness between the "X" and the "Mercury" and the model more than any other seaplane of the period. There are major differences between them. The taper on the leading edges of the models high-set wing, the absence of any ventral fin on the model. The cowling of the "Mercury", like the "Kirkham-Williams X" exhibit bulges concealing the Packard motor where there are not any on the model. However, if I see through these differences I can see a resemblance as noted in the previous entry. The "X" was of biplane configuration. The tapered high-wing model may have been one of a number of models proposing different monoplane wing positions, finally settling upon a straight mid-wing layout. The ventral fin of the 1927 "Gloster IV" biplane was removed when redesigned as the low-wing "Gloster VI" of 1929, so maybe this was an attempt to do something similar. I am puzzled by that cowling though. If the model was designed to be a racer, surely the cowling would have had a greater volume to accomodate the X-type in-lines of the period. You said the Packard used was an interim design. Do you know what was the aircraft's intended motor was? Could this intended motor fit in the volume exhibited by the model? There is one way of sorting this problem out. Are there any Dennis Punnet's out there? Can any of the forum members (Roy? ) draw a 3 view of the visible parts of this intriging model and compare it to 3 views of both the "X" and the "Mercury"? Yes that's right, it says Mercury High Speed on the NAF general arrangement drawings too. The final mid-wing design dates back to at least the second half of 1928 as it is shown, in wind tunnel model form (and as a land plane) in the October edition of Popular Science. I guess they could have experimented with alternative layouts but would they have been so different? For simplicity I would have thought there would have been one basic design with different wing positions, if you change too many details it is hard to determine what works and what does not. John Kean wrote a series of three articles for Aviation magazine in 1930 and in one shows a wind tunnel model for a projected NAF racer. It is very different in all respects from the one I posted in this thread, which is why that I doubt that it has a NAF background. Sorry, when I said interim Packard I meant that it was not the actual unit intended for the race, it was the same Packhard 1A-2775 model, just a less highly tuned one. Williams planned to swap the engines over during the voyage to the UK. The Gloster IVA and IVB had their ventral fin and rudder extensions removed to cure a tendancy to snake at high speed, something from which the IV, with just a dorsal fin, had never suffered. Since the NAF wind tunnel model published in Aviation is so dissimilar to the one published in Model Airplane News, I'll accept that I am probably seeing something that is not there (so easily done typing with one hand and a glass of red in the other!). It would be fun to find out what it looked like in 3 view form though. Do the floats conform to an known Edo design (I did see some Edo plans posted on this forum somewhere)? If they do conform to a known type, this will give a correct perspective to enable the rest of the model to be realised by a technical illustrator, which in turn may answer your original query. Interesting point, I hadn't thought of approaching it from the point of view of the floats. And thinking of Edo I then noticed that there is a whiff of Lockheed Vega about the overall shape and layout. I wonder if it could be a Lockheed design? Or basically something from the pen of John Northrop or Gerard Vultee, who designed the Vega. Sorry, back to the "Mercury"! Just found that website from which I incorrectly quoted the aircraft as the "Kirkham-Williams Mercury" (one of many!). Obviously it was barely capable using the Packard, but a USN engine? I didn't know they partook in such goings-on! Do you (or anyone else for that matter) know of USN built engines of the 1930's? 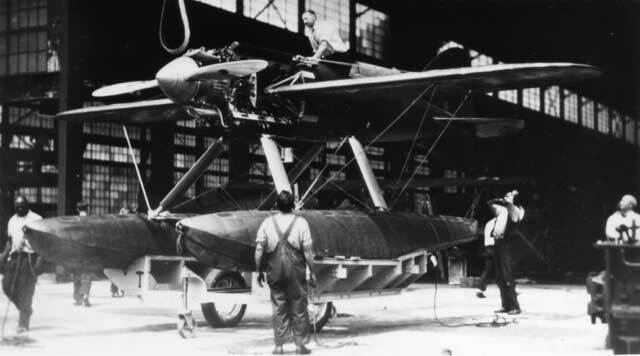 As for the floats, I thought if the float design could be pinned down in some way it may give an indication as to the approximate size and weight of the seaplane the model depicted. However on looking at the photograph again this may be difficult since parts of both floats are obscured. Lockheed Vega? Sorry, I can't see this aircraft in the model apart from the leading edge taper and wingtips. Please could you elaborate.